Basket racks are great for airing out smelly gym clothes, organizing personal items, or storing crafts and office supplies. These Penco basket racks are great for storing smelly swim trunks, jerseys, shorts and more. 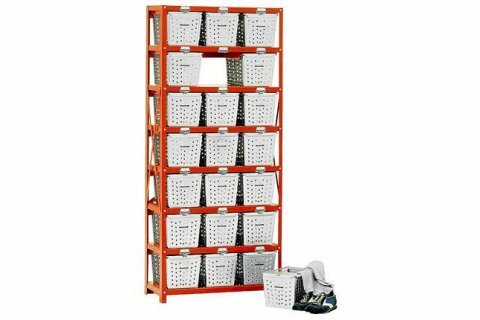 The open construction of these racks promotes airflow to eliminate odors. Worried about leaving your clothes out in the open to air out? 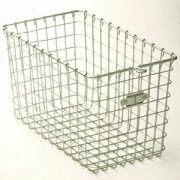 Each opening in these basket racks includes a 14-gauge padlock hasp. 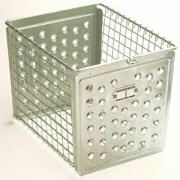 Three inch dividers between the baskets and on the end make each basket inaccessible from the other openings. With individual aluminum number plates, these racks ensure that personal belongings will be easily identified. Hertz Furniture is a proud member of Penco Products’ exclusive “Eagle Club”. Penco has designated Hertz as a star locker performer, qualified to take care of all your locker needs, from planning a new layout, ordering the correct parts, and installing them in your facility. 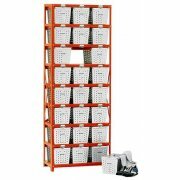 Durable: 13-gauge posts and 20-gauge shelves make these racks highly durable. Organized: Each space has an individualized aluminum number plate, so you won’t get confused about where you put your stuff. Secure: Each opening has a 14-gauge padlock hasp. 3” dividers between openings and on the end ensure that no basket can be reached from an adjacent opening or the outside. 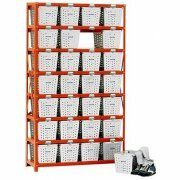 Efficient: Units can be bolted together to form double faced racks. 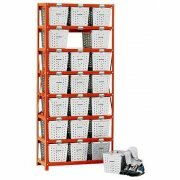 Minimizes Odor: The open design of these racks makes them perfect for airing out odorous items such as gym shorts or jerseys.